We don't have kids but we do the same thing with our pets. As we're drifting off to bed we go through each one of our pets and gush about their awesomeness. Caroline is hilarious, as always. I don't know how you keep a straight face with her around. P.S. I thought of you when I made the foil baked salmon I posted today. You are to thank for my foil packet obsession! Kids say the darndest things! How cute :) And this salmon recipe looks fantastic! I've been trying lots of fish dishes lately and I'm putting this on my list. I really hope my future kids are good eaters...REALLY. 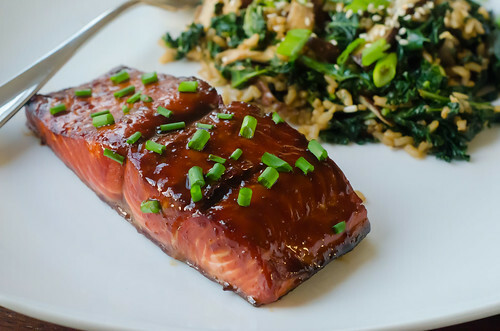 I also really need to try this teriyaki sauce! I've been on the lookout for a good homemade version. 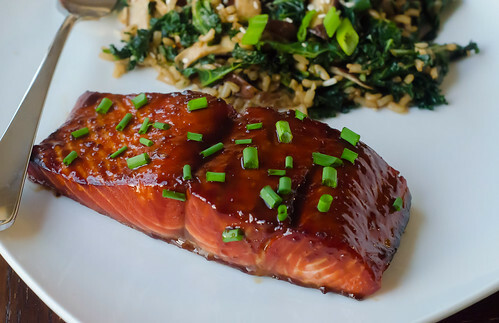 Looks delicious and love the part about where does salmon live. My boyfriend and I talk about how amazing our dog is, I can only imagine one day when we have kids -- yikes! Hi Josie, can you share your recipe for the side item featured in the picture? I'm always on the hunt for new and yummy side dishes! thanks! oooh, i loveeeeeee salmon.. this looks so good.. and i love it with brown rice, asparagus and mashed potatoes! gorgeous pics. This was fabulous. Perfect and easy weeknight dinner.